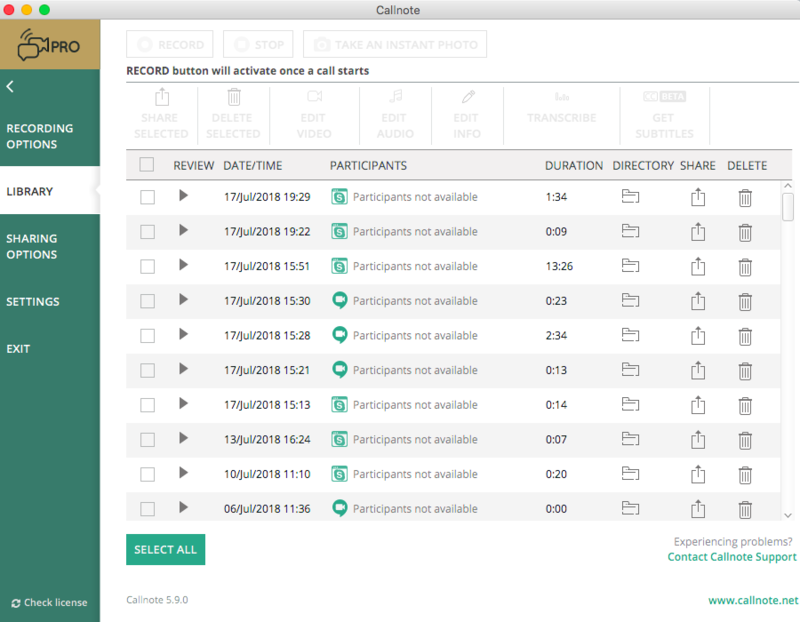 With powerful new features and an intuitive interface, Callnote allows you to create and share remarkable video recordings. Callnote library is a place where you can find and manage all the recordings you made. Our latest update improves the library’s interface and options. Selecting the recording and clicking the directory button forwards you to the place where all Callnote’s files are saved on your computer. Your audio recordings are saved as mp3 files and video as mp4 files. Callnote records both sides of the call as separate audio tracks. Use the header row to sort the recordings by date and time, by participants, by duration. Select the recording and press the review button. The recording will be played back to you with the default media player. Select one or several recordings and click the Delete button to remove them from the Library. Store one or several recordings in the Cloud – Google Drive; OneDrive; Evernote; Dropbox or share via Facebook or upload to Youtube instantly. You need to set up forwarding in Sharing Options Tab beforehand. Add professional touches with easy and functional editing tools. You can trim the file, add eye-catching intro or highlight key points with text and many more. Refer to the blog post for more details. Rename the recording’s title, add or manage participants, add tags or some notes to summarize the conversation. Your tags and comments can be invaluable for storing in Evernote where you can find and file them based on different attributes. Here’s how you can automatically transcribe your audio or video file in just a few minutes and add subtitles. With Callnote you can track and quantify emotions to get a complete understanding of nonverbal interaction. Get the latest update now!